Radioactive waste is leaking from six underground tanks at America's most-contaminated facility in Washington, the state's government announced on Friday. Just how much toxic stew got into the Columbia River's underground basin is unclear. The leak at the Hanford Nuclear Reservation has so far not posed an immediate health risk to the public, Governor Jay Inslee said, because it will take a long time, years perhaps, for the waste to reach the groundwater. But the leakages have not been stopped yet. The US Department of Energy spokeswoman Lindsey Geisler promised federal officials will to collaborate with Washington State to deal with the emergency. US Senator Ron Wyden from Oregon, who chairs the Senate's Energy and Natural Resources Committee, said that "This should represent an unacceptable threat to the Pacific Northwest for everybody. There are problems that have to be solved, and the Department of Energy cannot say what changes are needed, when they will be completed, or what they will cost." The US Department of Energy had earlier said that toxic radioactive liquid level was decreasing in one of the 177 tanks at south-central Washington's Hanford Nuclear Reservation. The leakage was estimated in between 150 to 300 gallons (560-1,100 liters) a year, posing a real threat to groundwater and rivers in the region, state officials acknowledged. Monitoring wells near the tank have not detected higher radiation levels, AP reported. After the news about the leakage made into the headlines Governor Inslee visited Washington, DC, for consultations with federal officials, where he learnt that actually six tanks were leaking. He called the development of things as "disturbing" and promised to "vigorously pursue" a course of new actions "in the next several weeks." 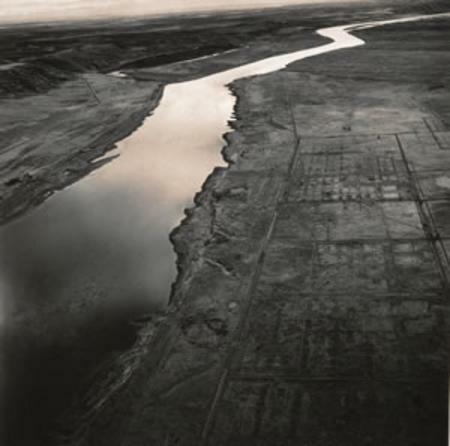 Established in 1943 as part of the Manhattan Project, the Hanford Nuclear Reservation facility was constructed very quickly on the bank of Columbia River holds millions of liters of a highly-radioactive stew left from decades of plutonium production for nuclear weapons. All of the radioactive waste storage tanks at Hanford Nuclear Reservation are long past their intended 20-year lifespan. Those tanks have a long story of unreliability. The documentary 'Waste: The Nuclear Nightmare' by filmmaker Eric Guéret and producer Laure Noualhat, filmed in 2009, maintained that the first leakages were registered in 1960s and by now up to 67 out of 177 tanks with radioactive waste have failed. An estimated nearly-4,000 tons of liquid radioactive waste have contaminated the environment over the decades as a result.The water from the Columbia River has always been used in technological cycle at the Hanford nuclear facility. The systems' pumps used river water to cool down reactors and then returned it to the river.In 2002 test of Columbia River fish exposed presence of radioactive Strontium 90 in samples. In spite of the leakage problem reported as being fixed in 2005, the latest developments exposed that "only a narrow band of measurements' was evaluated, acknowledged Inslee. This means that falls in the levels of radioactive waste in the tanks is an established fact, but nobody knows exactly how much the levels have been changing over time. "It's like if you're trying to determine if climate change is happening, only looking at the data for today," he said, calling it a "human error". In any case, the most important thing at the moment is "to find and address the leakers," the governor pointed out. The overall quantity of radioactive waste in the tanks is estimated at 200,000 tons, enough to fill dozens of Olympic swimming pools. The quantity of solid radioactive waste piled there is close to 710,000 cubic meters. 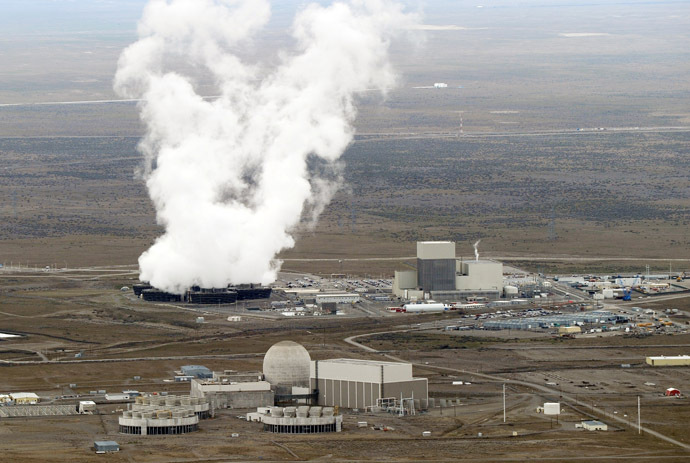 Governor Jay Inslee insists the Hanford Nuclear Reservation must be cleaned of radioactive waste, which would take decades and cost billions of dollars. Washington is already allocating for Hanford site $2 billion annually, actually a third of the national nuclear clean-up budget. But as the latest emergency expose this money is definitely not enough to ensure radioactive contamination security.A new report entitled '2013 Hanford Lifecycle Scope, Schedule and Cost' by the US Department of Energy estimates the remaining environmental cleanup at Hanford at $114.8 billion, a step up from 2012's $112 billion forecast. The DOA promises to increase the annual clean-up budget at Hanford to over $3 billion.At such a pace the operation will possibly continue till 2070 with post-clean management needed till 2090. And costs usually tend to increase with lengthy projects. 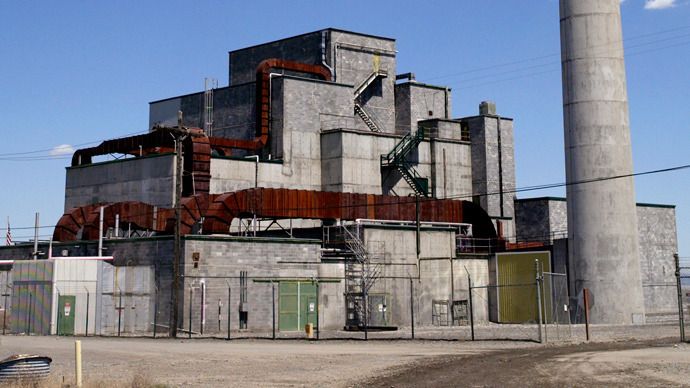 The site, near the town of Hanford in south-central Washington, used to be home to the B Reactor, the world's first full-scale weapon-grade plutonium production reactor. Plutonium produced at the facility was used in the first nuclear bomb, tested at the Trinity site, as well as in the Fat Man, the 21-kt bomb detonated over Nagasaki, Japan.Several reactors commissioned at the Hanford facility produced most of plutonium (57 tons) for the American nuclear arsenal (60,000 warheads and bombs at the peak). Production continued for over 40 years and was stopped in 1987.The site was constructed in what was considered a poorly-populated mountain area, but today there is a Tri-City metropolitan area (towns Richland, Kennewick and Pasco) just miles downriver from the facility. The population of the metropolitan area exceeded 250,000 as of the 2010 census. There are also at least six Native American reservations situated close to the site.The new project of the US Energy Department implies constructing a plant that will transfer all of the radioactive liquid at the Hanford facility into glasslike logs for secure storage. But the estimated $12.3 billion cost of the factory has surpassed the budget by billions of dollars already and lags behind schedule. The new program is expected to be operable no earlier than in 2019. Meanwhile the authorities have to utilize a limited budget to build additional tanks to prevent an environmental disaster until the new technology is in place.